I visited the Wayne County Courthouse (Indiana) today to follow up on my research plan on finding naturalization/citizenship info on my 2nd-great-GF, Paul Mayer. First, I had checked some online info where the state of Indiana has digitized and indexed these records, but he wasn’t listed. At the courthouse, they had a card file, and he was there. We pulled the naturalization book and found the above. 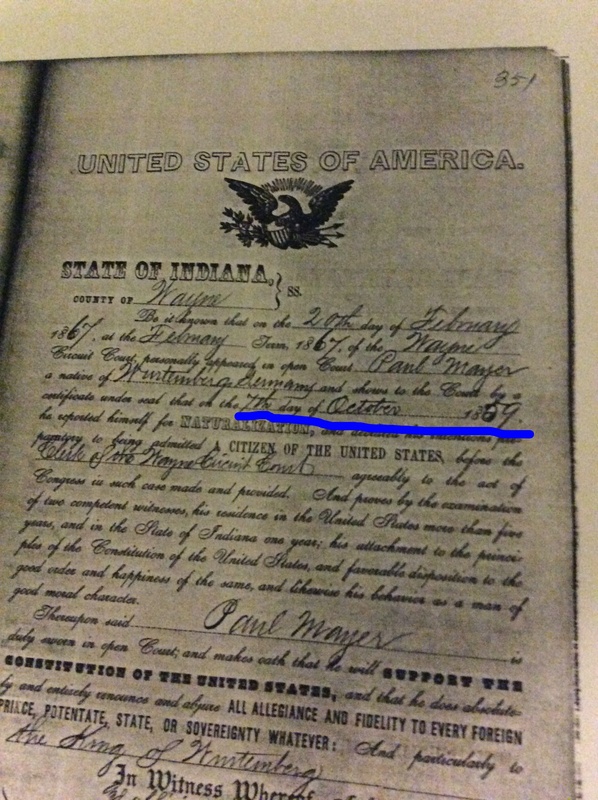 Underlined in blue is his declaration of intention, dated 7 Oct 1859. His certificate of citizenship was granted in 1867. I have yet to find a date of immigration or a date of arrival for him, but now I have a solid date of him being in Richmond. This certificate mentions him having 2 competent witnesses. Next up, when I have more time, is searching court records (if they exist) about his court appearance and checking city directories. I like driving to Richmond. We take the National Road, and my favorite town along the drive is Centerville. In fact, I wouldn’t mind living there!